Dessert tables have become increasingly popular and it's not very hard to understand why. They're ridiculously pretty and better yet, they're ridiculously tasty! If you plan to treat your guests with a dessert table here are a few tips on how to make it look as great as it tastes. Once you've had your fill of advice click here to feast your eyes on 50 (yes 50!) jaw dropping dessert table ideas that will inspire you to create your own. Everything begins with a little spark of inspiration and a beautiful idea. First things first-you'll need to select a theme or color scheme, because just like your wedding your dessert table should be visually cohesive. Next comes the fun part, selecting all of your delicious goodies! An important part of every tasty table is variety. Since there are so many yummy things out there it is all too easy to find the perfect mix for your event. Now that you have all of your delectable morsels chosen you know exactly what will be on your dessert table, but your guests don't. Labels for each item, will not only look darling but will also help prevent any allergy uh-oh's. It will also let your guests choose exactly what their sweet tooth is craving without any guess work. It's also a good idea to provide some dressed up goodie bags or boxes. This way guests can enjoy some sweets on the way home. Don't wait until the day of your wedding to set up your dessert table display; a day or two before the big day set up all of the display dishes and decor. This ensures that everything will be exactly where you want it to be and will look gorgeous. All you'll have to do on the day of is pop the treats in place and voila! 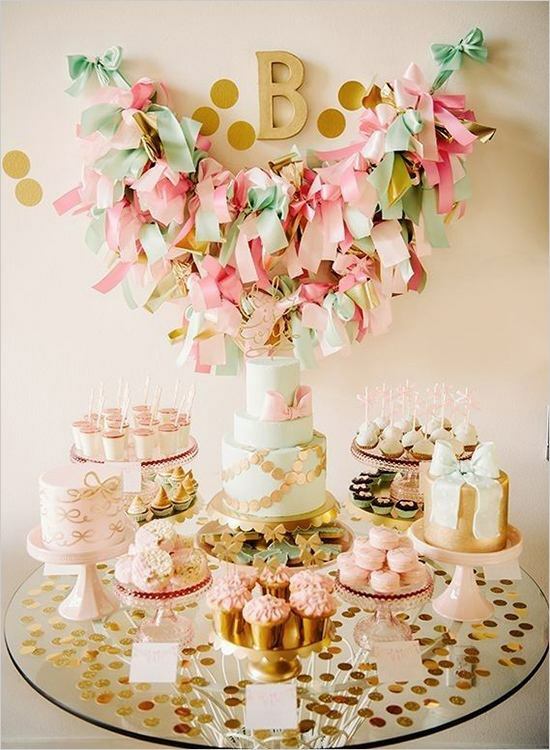 Are you loving the pink and gold dessert table above? Photographed by Lee Bird Photography and designed by Avie & Lulu. As for the design of the table itself symmetry is often used to pull everything together, but balanced asymmetrical looks can be just as cute. Choose whichever one feels the most like you. Every dessert table has it's focal point, most often the wedding cake, but if you are going cake free just choose whichever piece is tallest or most eye catching. To properly showcase all of your sweet treats it's important to have lots of levels with the tallest in back and shortest in front. Tiered stands and a variety of heights of cake stands are a simple and easy way to pull that off, however we've seen some unique and cute ideas that are just as workable, such as mini hay bales, vintage crates and suitcases, or if you choose to display your treats on something other than a flat table like a dresser or cupboard they may have built in levels of their own. Draw attention to your dessert table. Lovely floral blooms and other decor pieces can be added to brighten up the table itself and accent all the goodies. 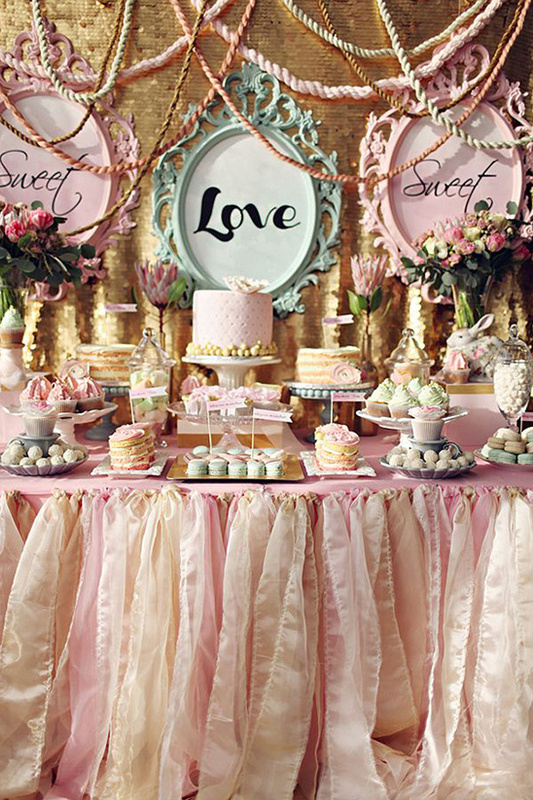 One of the best ways to get all eyes on your dessert table is to have a super cute backdrop. This can be anything from dazzling signage, ombre balloon displays, streamers or ribbons, and banners or buntings, or a mix. You can also dress up the front of the table for a little extra sparkle. The very last thing to do also happens to be the best: enjoy your dessert table and all the delights it holds! The perfect example of a cake table that is the perfect package all around is the one below found here, photographed by Sonya Khegay Photography. 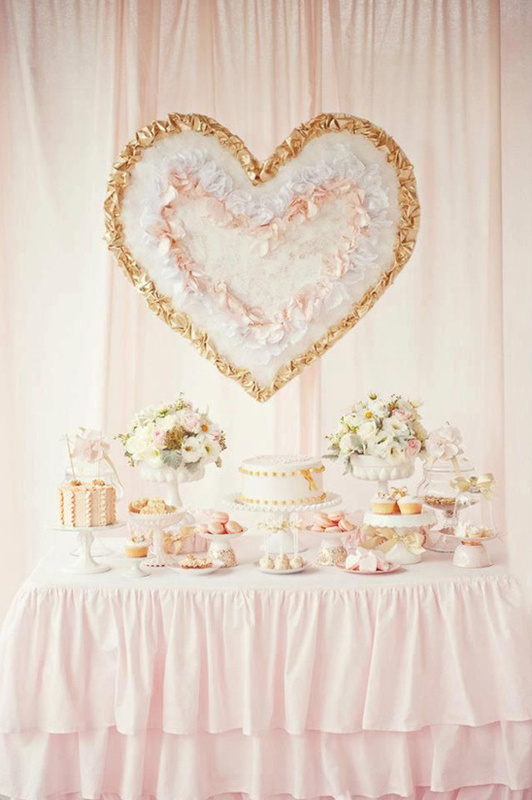 Click here to see our favorite Dessert Tables.